Preheat oven to 375. Once oven is hot spray both sides of the flat bread with some cooking spray and cook on a wire rack for 2.5 minutes, flip over and cook for another 2.5 minutes. Remove from oven and set aside. Bring water to a boil in a small sauce pan. Boil raw chicken for 12 minutes or until cooked through. While chicken is cooking slice up the red onion, shred the gouda cheese and cut the fresh mozzarella into smaller pieces. Once the chicken is done shred in a small bowl with two forks, season with fresh ground pepper and mix in 1/2tbsp of BBQ sauce. 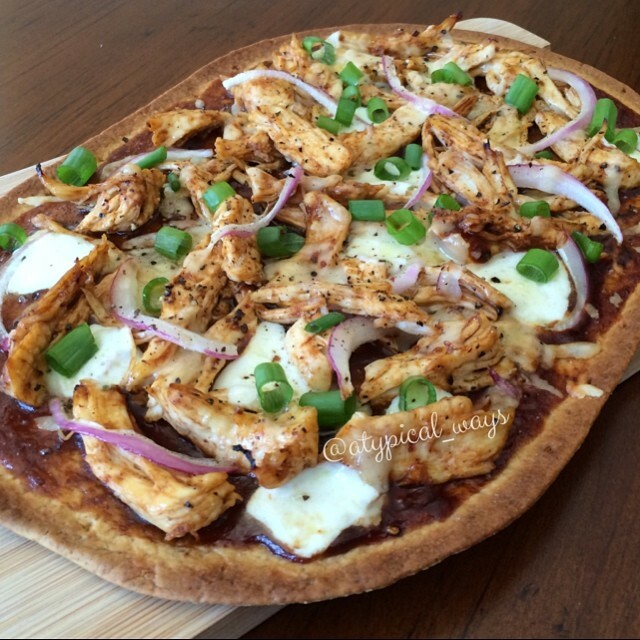 Top the flat bread with the remaining BBQ sauce (32grams) and then the chicken, cheese and red onion and some more fresh ground pepper. Bake in the oven for about 10 minutes and broil on high at the very end until cheese is bubbling. Top with some chopped green onion.